Our product range includes a wide range of orifice plate installation. Orifice flange assemblies’ consist of weld neck type flanges with studs, nuts, and gaskets. 1 ½”to 24” line sizes. It gives an acceptable level of uncertainties at lowest cost and long life without regular maintenances. Orifice Plates are most commonly used as primary element for flow measurement in pipelines based upon the principle of measurement of ‘Differential Pressure’ created when an obstruction is placed in the fluid flow, due to increase in fluid velocity. 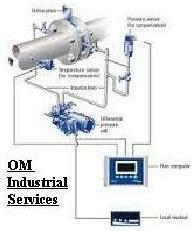 Instrument tubes Instrument Installation as per site requirements standards..